This weekend, 4 year-old Sam was playing his beloved Hot Wheels games on our 4 year-old iBook G4. He was complaining about the game being too hard for him to play (he couldn't advance levels by winning races) so I reluctantly agreed to try to get him past the first level. After playing the game for a few minutes, it seemed like the computer was running really slowly, so I tried the same game on my work computer (a Lenovo T61p laptop). Wow- it was so fast I couldn't believe it! And the game was actually pretty fun. We spent the next half hour having a great time as he encouraged me to complete each level and unlock new cars. This gave me an idea: This web-based game would be the perfect test for the 21.5" iMac I've been eyeing for a potential family Christmas present. We stopped in at the Apple Store today to give it a try. We walked into the store and found an open station in front of the machine we're considering. 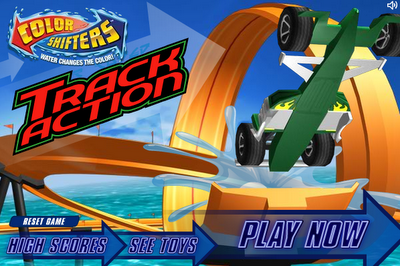 I pointed the Safari web browser to HotWheels.com and navigated my way to the famous "Colors Shifters Track Action" game. A pop-up appeared saying that the Adobe Shockwave Player wasn't installed and prompted me to download and install it. I was familiar with this maneuver on the Mac since I upgraded the version of Shockwave on our iBook just yesterday so I proceeded with the download and installation. Unfortunately in order to install Shockwave you need admin privileges, but just as I was about to give up, a friendly Apple Store employee appeared. He typed in the admin and installed Shockwave. As it was installing, it said something about 32-bit vs. 64-bit but we plowed forward and completed the installation (don't we always plow forward?). We reloaded the web page and although it didn't complain about Shockwave any more, Safari rendered an empty box where the game normally appears. Hmm... "What's up with that?" I thought. The employee jumped over to a neighboring machine, did a quick Google search and then came back over to our machine. He did a Apple-key/"I"-key combo, brought up Info on the Safari application, asked it to open in 32-bit mode, and restarted it. We navigated to the game page again and this time it rendered correctly. We played the game and it was very fast. This little 32-bit flakiness is something that I thought would be an advantage of Snow Leopard vs. Windows 7 (Apple's latest and first full 64-bit OS I believe, whereas Microsoft still asks you to choose which version of the OS you want to install: 32-bit or 64-bit). Turns out, there's components in the system that still need to run 32-bit and you might have to occasionally fiddle with this on a per-application basis. Lest you think this is going to be a Mac-bashing piece, I thought I'd related a similarly frustrating story from this past week on my PC which also relates to Shockwave. 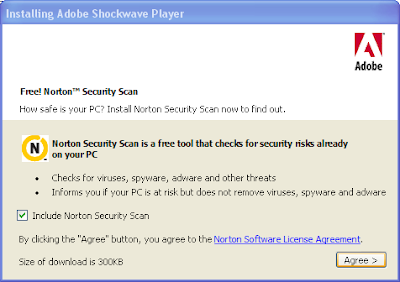 A while back, I noticed a Norton Security Scan application pop up. I thought perhaps it was a work thing, but it was hard to tell. Wherever it came from, it was very persistent and I had a hard time stopping it from scanning my computer once it started. After asking around, it sounded like I may have inadvertently installed it so, I removed it. So what's the point of the story? The point is that all computers can be a pain in the neck. We can say all we want about one operating system being better than the other, but all computers suffer from some flakiness of one sort or another as part of doing the things we do with them. But here's the thing... 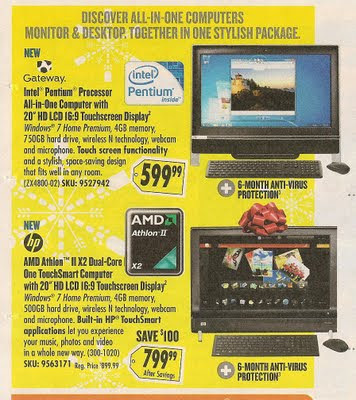 In terms of buying a computer, you've got to do something if you're interested in being online without getting frustrated waiting for a slow computer. And with the iMac, at least you have a snazzy looking machine that can run Mac OS -or- Windows. Look at these alternative all-in-ones from Best Buy. You've got to be kidding me- why can't the PC industry make a better looking computer? Wait! Do my eyes deceive me? Is this a Best Buy ad, posted by none other than Robert Dwyer?? ?